Step 1 Cut the zucchini in half lengthwise. Make some diagonal incisions on the cut side. Sprinkle the cut side lightly with salt and place the zucchini halves on a wooden board, cut-side down. This will allow some of the liquid to drain away. Step 2 Heat the oven to 350 degrees. Put the chopped parsley and mint in a bowl and add the garlic and breadcrumbs. Add half the oil gradually, while beating with a fork. Season with a good grinding of pepper and with very little salt. Step 3Oil a shallow baking or lasagna dish large enough to hold all the zucchini halves in a single layer. Step 4Wipe the zucchini halves with paper towels and lay them in the dish, cut-side up. Spoon a little of the herb mixture over each half. Drizzle 1 tablespoon of the oil over the halves and cover the dish with foil. Bake for 30 minutes. Step 5Remove the foil and continue baking until the zucchini is tender and the top is crisp, 10 to 20 minutes longer. Step 6Drizzle with the remaining olive oil while the zucchini is still hot. Serve warm or at room temperature. In Recipes-list.com we have selected the most viewed recipes from category - Sides Vegetables . Enjoy the best recipes specially selected for you! 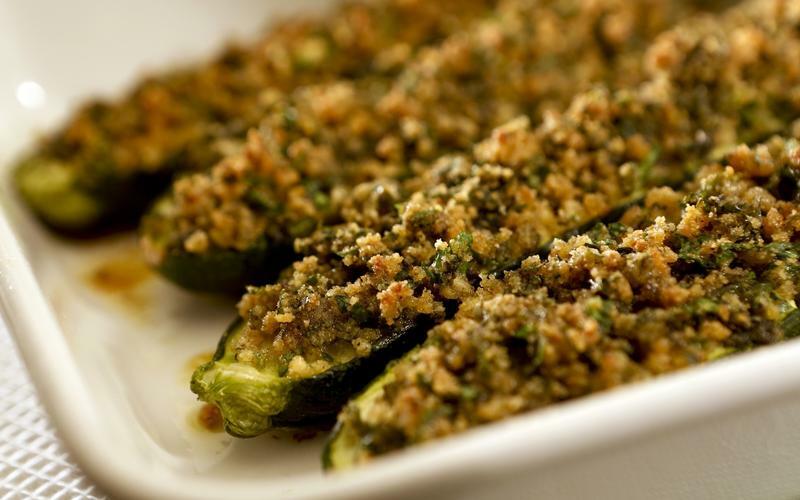 Baked zucchini with mint and garlic stuffing is the right choice that will satisfy all your claims.